Note: There is also a ThermoFuel V9 for Women formula! 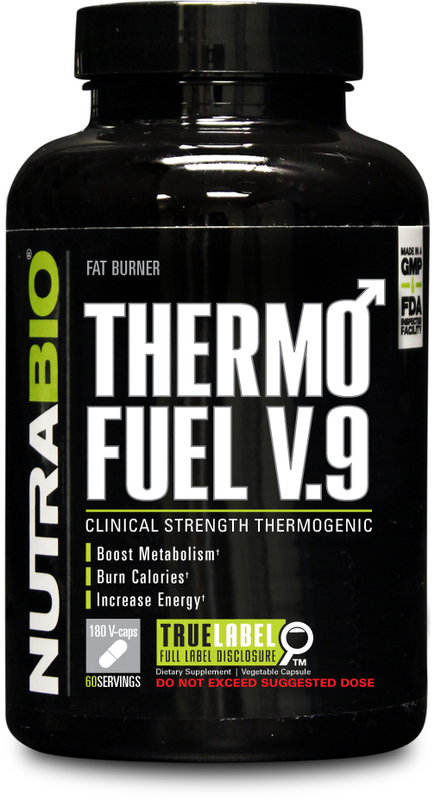 NutraBio ThermoFuel V9 for Men is a highly-effective and clinically-dosed fat burner that is specifically formulated to fit the needs of metabolism and biochemistry using a purpose-built ingredient profile and dosing strategy. Like all NutraBio products, ThermoFuel V9 for Men does not use proprietary blends to hide the real dosage of its ingredients. Each active ingredient in this formula is in its full science-backed dosage, which is fully disclosed on the label. In addition, ThermoFuel V9 for Men contains no additives, fillers, or excipients. We made these quality commitments over 15 years ago because we believe you have the right to know exactly what you're putting in your body. Caffeine-containing supplements have been investigated in relation to their ability to support resting metabolic rate. Previous research has reported that caffeine (and caffeine-containing supplements) is able to acutely increase resting metabolic rate. * Even low doses of caffeine (100mg) have been reported to significantly increase resting metabolic rate by approximately 4% over a 2.5 hour following ingestion. The magnitude of the resting metabolic rate response is linear with increasing dosages of caffeine intake. Specifically, doses of approximately 100, 200, and 400 mg of caffeine have been shown to significantly increase resting metabolic rate up to a 3-hour period by about 4%, 11%, and 16%, respectively. Thermogenics are compounds designed to amplify body heat production and thereby increase energy expenditure and promote weight loss. One such compound that is classified as a thermogenic is epigallocatechin gallate, also known as EGCG. EGCG has been theorized to increase energy expenditure by stimulating brown adipose tissue thermogenesis. In support of this theory, Dulloo et al. reported that EGCG in combination with caffeine (e.g., 50 mg caffeine and 90 mg epigallocatechin gallate taken 3-times per day) significantly increased 24-hour energy expenditure and fat utilization in humans to a much greater extent than when an equivalent amount of caffeine was evaluated suggesting a synergistic effect. Recently, work by Di Pierro and colleagues reported that the addition of EGCG to a hypocaloric diet resulted in a significant increase in weight loss (14 kg vs. 5 kg) versus a hypocaloric diet alone over a 90-day clinical trial. Theoretically, the increases in energy expenditure via EGCG supplementation may help individuals lose weight and/or manage body composition. The last thermogenic compound added to ThermoFuel V9 for Men is the patented compound Advantra Z. Because Advantra Z contain synephrine it is able to stimulate thermogenesis, increase lipolysis to facilitate the burning of fats for fuel, reduce weight, increase lean muscle mass, and support appetite control. * Advantra Z also improves athletic performance and uptake of amino acids into muscle cells. During intense exercise, carnitine may help reduce the respiratory exchange ratio and lactic acid buildup in muscles, leading to increased energy and greater resistance to muscle fatigue. Put simply, carnitine helps your body burn its own stored fat as energy, leading to increased endurance, work output and exercise capacity. Studies show that it may even preserve muscle glycogen during exercise, keeping you energized even longer. Theobromine is a methylxanthine, which is a chemical relative of caffeine. When theobromine is absorbed by the body, it activates an insulin signaling pathway, which causes a mild increase in glucose uptake. Increased glucose uptake means the body is able to take in sugar from the blood more effectively. Furthermore, Theobromine is a mild stimulant that works in conjunction with Infinergy Dicaffeine Malate to give a smoother, longer lasting synergistic effect. Maximizing fat loss and achieving a lean, hard physique requires putting in the work at the gym and in the kitchen. However, sometimes even the best exercise and diet programs need an additional push. The clinically dosed ingredients found in ThermoFuel V9 for Men create a synergistic combination, working together to make your dieting and training efforts more effective. With ThermoFuel V9 for Men, you don't need to worry about cutting through all the bull, NutraBio has done that for you with our fully transparent label! All that's left to do is let ThermoFuel V9 for Men cut through the fat. Q: What is the best way to take ThermoFuel for Men? A: Fat burners are created for anyone trying to decrease body fat. They often have ingredients designed to support your metabolism and help burn up stored fat. * A fat burner can assist you greatly in getting into better shape and to motivate you with quickly noticeable results. Q: I see ThermoFuel V9 for Men may help me support my metabolism. What will that do for weight/fat loss? Q: Can I stack my pre-workout with ThermoFuel V9 for Men? 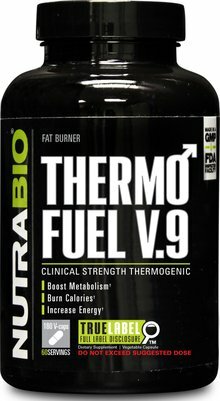 Q: What other NutraBio products do you recommend taking with ThermoFuel V9 for Men? A: In order to promote optimal fat loss and gains in lean muscle mass we recommend stacking ThermoFuel V9 for Men with our 100% Whey Protein Isolate, IntraBlast, Reload and MultiSport.